The event was held in the enormous, quadrangle-shaped Patent Office.1 The north hall was used as the main ballroom, festooned with flags, banners, and army corps insignia. The late supper was held in the adjacent west wing, where a 250-foot-long table was placed in a corridor twenty feet wide between the patent model cases. At the center of the table stood a huge, white pastry in the shape of the Capitol building. There was also a pastry model of Fort Sumter, surrounded by ironclads, along with numerous pyramids of fruit and candy.2 Ironically, one of the ornamental sculptures was named “The Progress of Civilization.” As it turned out, civilization took a step backward that night when the hungry crowd jostled for food in the narrow space. In fact, it is surprising that even a few menus escaped the bedlam. How that came about may surprise you, for it seems they were saved by the same men who had saved the Union. The first phase of the supper went smoothly. At midnight, the presidential party was escorted into the west hall and seated at the end of the buffet table where they could dine privately before the others were admitted. The menu below is printed in gold on thick paper with a shiny, porcelain-like finish. It looks as if it was designed to be part of the gastronomic display, propped up at intervals along the table. Still, it also seems likely that the waiters presented menus to the president and his guests to help guide their choices. The bill of fare begins with three distinctly American dishes—pickled oysters, oyster stew, and terrapin stew made with the Diamondbacks that lived in the nearby brackish waters of the Chesapeake Bay. 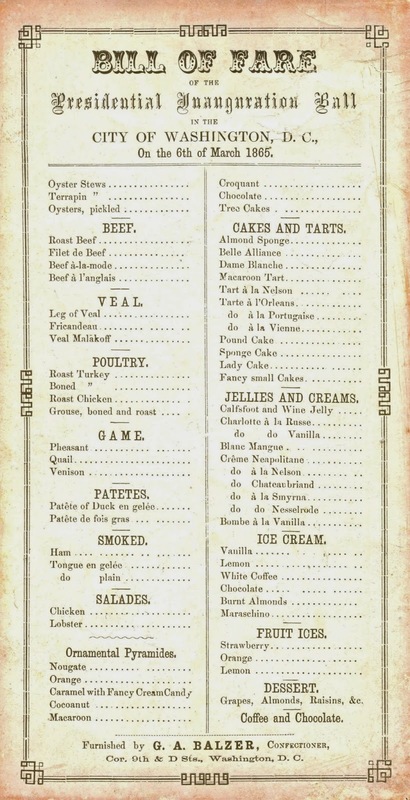 The German-born confectioner G. A. Balzer prepared a wide selection of meat and game dishes, and a vast array of sweet desserts.3 At the time, it was not unusual for there to be no vegetables on the menu at a late ball supper. After the presidential party had finished eating, they returned to their sitting area. It was at this point that the doors to the supper room were flung open and the mad rush was on. The ball was attended by well over 4,000 people, many of whom were determined to “eat their ten dollars’ worth,” according to one observer. (A $10 ticket admitted “one gentleman and two ladies.”) Since the table could only accommodate 300 people at a time, men tried to carry away large platters of food for their friends, spilling much of it on the surging crowd. The New York Times reported, “In less than an hour the table was a wreck. . . positively frightful to behold.” The Washington Evening Star described the floor as “sticky, pasty and oily with wasted confections, mashed cake, and debris of fowl and meat.” In addition to the mess on the floor, many fine gowns were ruined in the melee. 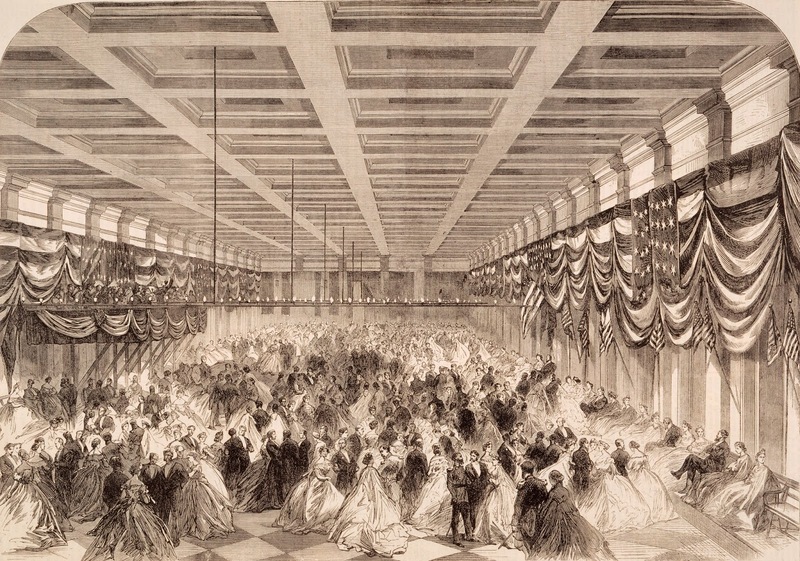 Undaunted, the revelers returned to the ballroom, where they danced until the early morning hours. The president and his party quietly slipped away at 1:30 AM, taking a little-used passage to a side exit. Five weeks later, the president was assassinated just a few blocks away. Menus from the inaugural ball are scarce; there may be no more than three extant copies. Perhaps only a few were made for display purposes and use by the presidential party. Another reason for the scarcity may be related to the chaotic nature of the event. It would have been difficult for someone to safely procure the 5½- x 8½-inch card—it was too large to be slipped into a pocket, and too thick to be folded without cracking. However, the president and his guests had early access to the menus and were in a unique position to hold onto them. After supper, they moved to a special area where they sat for less than an hour before going home. Supporting this notion, at least two of the three known copies appear to have been saved by members of the presidential party. Although the provenance of the menu in the Library of Congress is not complete, there is evidence to suggest that the one in my collection once belonged to Gideon Welles, the Secretary of the Navy. The menu now at Johnson and Wales University was acquired from the Lincoln family after it had been in their possession for many years.4 Interestingly, the family maintained that it had been saved by the president himself. It is intriguing to imagine that Abraham Lincoln may have kept a menu as a souvenir, marking a joyous celebration he hoped would be a new beginning. 1. Completed in 1868, the Old Patent Office building is now home to the Smithsonian American Art Museum and the National Portrait Gallery. 4. The inaugural ball menu in the Louis Szathmary Collection, now held by the Culinary Arts Museum at Johnson and Wales University in Providence, Rhode Island, was not included in the culinary archives donated to the University of Iowa. Very nice post! I've looked into finding recipes for some of those fancy desserts but have had no luck!